Strat-toting, denim-clad Rory Gallagher, subject of a new rock flick by (gulp) Tony Palmer. STEVE CLARKE talks to the unpretentious journeyman of white blues. DIG THIS: a movie about Rory Gallagher, a large part of which was filmed in Gallagher's home-town, Cork, is being premiered at the Cork Film Festival. Got that? Now put yourself in Gallagher's shoes- he usually wears soft comfy shoes so you won't get sore. Home town's film festival and on The Big Screen. Wouldn't you allow yourself a little bit of ego-tripping, a little bit of posing? Even you dear old mother is sitting there dolled up to the nines. Wouldn't you put on your best togs and bask in the limelight? Of course you would. But Gallagher doesn't. The customary jeans have been discarded for a pair of straight black pants, but Rory's still wearing one of his eternal checked shirt and jean jacket ensembles. And he's not strutting around the Capitol Cinema, playing superstar. The Cork Film Festival- rated behind Cannes and Berlin, according to Gallagher's publicist ( shouldn't Montreux be in there somewhere?) - is in its seventh year. The Gallagher movie is the first ever rock film to be entered at the festival. It was directed by Tony Palmer whose previous rock film include "All My Loving", "Farewell Cream". Jack Bruce's "Rope Ladder To The Moon" and more recently, documentaries about Liberace and Hugh Hefner. Palmer, who reckons he's only 29 - " A year younger than Eric, " as he puts it ( a Palmer-directed Clapton movie is on the cards) made the movie with Gallagher because he's into his music. He thought a film about Gallagher would demonstrate to the public at large that not all pop/rock music is the Wombles at one end, or drug addicts at the other. Palmer has all the marks of a nose- in- the -air school-master: short nondescript hair, heavy rimmed glasses and an undistinguished style of dress. Not the accepted film director image, but then Rory Gallagher doesn't live the life the public would expect of a successful rock musician, as Palmer pointed out. On average, Palmer's approached once a week by various pop artists to make a film about them. He hasn't topped the half-dozen mark yet so Rory Gallagher is a pretty privileged fella. Originally conceived as something suitable for showing on "Omnibus", it got longer and generally more ambitious than envisaged and wound up as a 90 minute film for cinema. It's called "Irish Tour '74" - you didn't expect a Rory Gallagher movie to be called something flash, did you?- and after a London premier will go on release next month. "We wanted a film for people who couldn't get to see the band live, " says Rory. "Originally we thought of it as being a film of us performing four or five tunes, but it turned out to be more a film of us on the road." At the showing, the cinema isn't too full, the high-price tickets for the weeks' film festival keeping a lot of Gallagher fans away. Still there are a few of Cork's Rory Gallagher freaks there. One of them comes up to him and asks for an autograph. "Sure", Rory replies, taking the piece of paper now, is that with an E or without?" He signs, humble and polite as ever. He sits down next to his mother, a middle-aged lady in emerald green (what else?) slacks, a neat blouse and a scarf tied around her neck. Her features, though softer, are just like her famous son's. Rory's brother Donald is there and so are the band. Donald is credited as "road manager" in the movie, but Rory says it's impossible to put an exact label on his brother's role with the band. He's worked with Rory since Taste days and wherever Rory goes, he goes. Gallagher's agent, David Oddy, is also present. Rory still maintains he doesn't have a manager as such and Donald, Oddy and himself take care of the business side of the Rory Gallagher band. The band- Gerry McAvoy (bass) Lou Martin (electric piano) and drummer Rod DeAth- sit in the same row and when their faces come onto the screen they exchange glances. Like Rory, they're not geared up for the occasion. 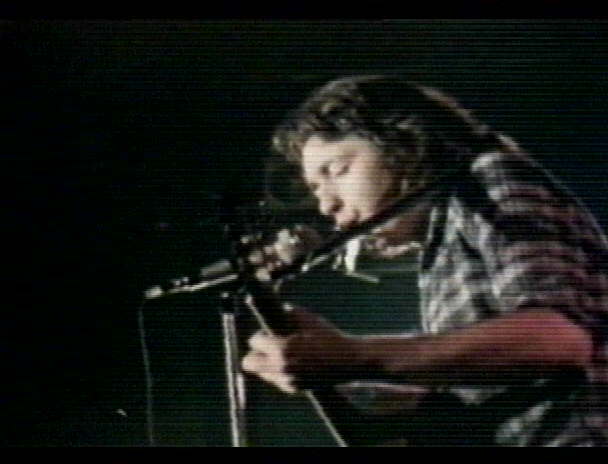 "Irish Tour '74" is basically a successful film about Rory Gallagher. There are a few cliched techniques here and there, but as a documentary of Gallagher's music on the road (more than just about any other artist I can think of Gallagher's music is essentially for the road and he's always on the road) it succeeds. The bits that don't are when you see the band driving into the sunset/sunrise. Or there are shots of Rory walking around Blarney Castle looking thoughtful. Or Rory leaning on a road-side fence still looking thoughtful. Palmer maintains those shots weren't contrived - he just asked Gallagher what he was doing the next day and did he mind if he brought a camera or two along with his packaged lunch - but they took it. Rory's no actor and I'm sure he felt embarrassed having a camera trailing around after him. In so much as the film shows Gallagher totally into his music, there's no surprises. It shows him at his happiest on stage in front of people. The close-ups are revealing in that they show Gallagher's contented beam when he is playing for the people, egging the rest of the band on. There's no script as such - the cameras just barged their way into the Gallagher band's dressing room (they don't have separate dressing rooms) and filmed away. The talking is all natural and so is the 'acting. The Gallagher band don't take exotic drugs backstage and don't entertain harems of black ladies. Instead it's all down to the Guinness and the music. The only formal talking is when Gallagher explains a particular guitar technique or gives a bit of his biography or his attitude towards being a rock musician. “I'm not into Rolls Royce's and mansions and all that cloak and dagger type of existence’ he says. Now who else could say that? And the music is just fine. You see the band playing "Hot Coals", "Bullfrog Blues", "Going to my Hometown", etcetera. Incidentally, the last mentioned was filmed in Belfast with the band's playing interspersed with shots of Belfast's decrepidation, soldiers and all, which is an indication of Gallagher's fondness for the city. And the music's all well-played and even though they didn't have any bass speakers at the Capitol Cork ( it was a wonder they had stereo) it does some over well. "Did you enjoy the film?" asks Gallagher afterwards. " I hope the music came through." A press conference and then a reception ensues. Rory has his picture taken with Carroll Baker (she's a film star, rock freaks) and he's presented with a gold disc for 250,000 sales of " Live in Europe." Then he has his picture taken. " Do you think we can get the band in here" he suggests and the the band walks into the camera's eye, which is as good a time as any to talk about Gallagher's band. Gallagher has played with Gerry, Lou and Rod for around 18 months now , although Gerry was with him before the other two joined. They're all Celts, as DeAth says, with McAvoy and Martin coming from Belfast and DeAth from Wales: There's no conspiracy to try to keep his band Irish, says Gallagher. They are all well into the blues and Martin and DeAth were previously with Killing Floor, one of the 1968 blues bands that didn't make it. On their last American tour Martin stayed on a while and jammed with Otis Rush one of his heroes. McAvoy has played bass for Champion Jack Dupree and before that went through the showband thing. Ask them what's it's like working for Rory and they'll say fine, although because of the number of gigs he undertakes it's hard work. Martin says that on the American tour there was one time when the band were playing two gigs a night for five days. Although Rory's the driving force, it's a band feeling, the say. They also say they've never seen Rory lose his temper, which is quite something. Ask them what he spends his money on and they'll say they don't know, but you get the impression that Rory Gallagher genuinely isn't too interested in money. Is it true that he lives in a nine quid a week flat at Earls Court which he shares with his brother? It would have been true two months ago, says DeAth, but he's moved out. Where to? Oh, still in Earl's Court and still with his brother. "I watched Top of the Pops tonight for the first time in years. It was, it was...there's no word in the dictionary for that programme, " says Rory Gallagher, beat-up old Strat hanging from his shoulders and mouth harp cradle fastened in place. It's three days later at Hull University where his mini-tour of British universities is opening. He said ages ago that he'd go back to small venues and he's doing it, even though he can sell out the biggest gigs in the country. Remember Gallagher played three nights at London's Marquee Club several weeks back? Now he's doing the universities. The best time of the day for Rory Gallagher is fast approaching as the social secretary asks if it'll be okay if Gallagher goes on at 10 o'clock. Gallagher is quietly enthusiastic as he messes between tuning his guitar to McAvoy’s bass and fidgeting with his harp. Even though Rory Gallagher has been on the road for at least seven years playing what is essentially the same music he is enthusiastic: even at Hull University- no disrespect intended, but it's not as though Gallagher is playing Madison Square Garden. "Did you hear about Mott the Hoople and Fairport Convention canceling their Irish tours?" he asks, obviously a little upset about the fact. He asks what Ariel Bender's like and then the conversation moves to Bad Company. "That's a great single they've got" he enthuses, making a gesture with his right arm that's usually reserved for describing the sexual merits of young ladies. The social secretary appears again and asks if they'll be ready in five minutes. Gallagher says sure and something about it's time to put in the make-up. "Out with the glitter" chuckles DeAth, rummaging in his suitcase for another pair of jeans. Actually with his long dark hair , skinniness and over-all denimness DeAth looks like the arch typical heavy metal kid. Gallagher and band take the stage at just past midnight. He and the rest of the band haven't changed radically over the last nine months, although their opening numbers - " Messin' with the Kid", "Cradle Rock" and a slow Muddy Waters blues - are looser and a lot more jammed than they used to be. Gallagher and Martin take the solos. Gallagher's songs, "Tattoo'd lady" and "A Million Miles Away" take up the mid-part of the set and demonstrate that he's capable of writing a good song. He plays " Going to my Hometown" and one of the strings on his mandolin breaks, but it doesn't bother the crowd too much who follow the rhythm with their hands and feet. A couple of acoustic blues are included and then it's boogie all the way home. Rory Gallagher is no musical innovator. What he and band play is essentially blues and boogie. The rhythm section is functional and both McAvoy and DeAth take short concise solos during " Bullfrog Blues". Martin also has his own keyboard style. Gallagher has stage-presense. He has charisma and he has humility. At the end of each number he takes a little bow and if my eye sight was better I'm sure I'd see that beam of contentment spreading across his features as the crowd laps up what he does. So his music will never change anything. But he's always at it and he does it well, and will be doing it just as well, probably better, in ten years time. For that reason he's an important man in British rock. After the gig is over a crowd of admirers hang around outside the dressing room, all male and about 16. There's one of those Who's the Best guitarist? arguments and Clapton's name comes up. "Who's he?" Who's Eric Clapton?" one of gallagher's admirers wants to know. "Why isn't he out there doing it now/" He points to the dressing room and shouts " Now, that's what I call a guitarist."